In the film Pulp Fiction, a car rolls to a stop. Inside, Vincent and Mia look out at Jack Rabbit Slim's - a 50's diner. What the f*ck is this place? This is Jackrabbit Slim's. An Elvis man should love it. The scene cuts to Vincent as he strolls through the Disney-esque establishment. Replicas of 50's screen idols wait tables amidst a dizzying display of poodle skirts, booths made out of cut-up Edsels, and thumping jukeboxes. Every single 50's stereotype is amplified tenfold. "It's like a wax museum with a pulse," Vincent remarks. This was, pretty much, what I was expecting when we ventured out to the city of Stanton to check out Park Ave, a new 50's themed restaurant. But as soon as I parked the car in the restaurant's deserted lot, I knew I was in for a surprise. First of all, the location. Next door was a trailer park. Across the street; a seedy motel. One block down, there's a liquor store with steel-bar reinforced windows. This is one section of Beach Boulevard where a tourist would fear to tread. It is an unlikely, and some might say, unfortunate, place for restaurant; let alone a restaurant with a chef who used to head a swank eatery in Beverly Hills. The restaurant's exterior beguiled me further. It had the appearance of those long-forgotten coffee shops in old San Fernando Valley that has seen better days and now has a date with a bulldozer looming. The front facade is composed of cut stone jutting out at odd angles. Aside from this, the building looked flat and depressed, like a single-layer sheet cake. And if it weren't for the presence of the buzzing neon signs and tall tiki torches, you wouldn't think that they were open for business. With my expectations discombobulated, we flung open the heavy, cherry wood door. Inside and straight ahead, my eyes locked on a vintage Elvis film, which was playing on the plasma screen held aloft over a handsome bar. He's on a speedboat with the sun on his face. The King is still young and sprightly; his hair greasy slick, his smile gleaming. 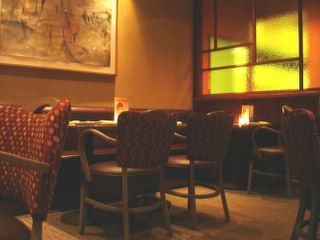 We are seated to the left of the entrance, in a long and sparsely lit dining room. Dark-hued woods and sumptous leather seats exude class and sophistication. There is a definite retro theme here, but it is deliberately and tastefully understated, without a touch of irony or kitsch. The term for this type of design is "Googie" which employs "space age" motifs accenting bold angles and swooping curves. But Park Ave uses only the right amount of it, never resorting to caricature. I am relieved that the vibe is actually more Rat Pack than Happy Days. This is indeed a place where Frank and his cronies, Dino and Sammy, could come to unwind, lighting stogies and downing stiff martinis, all the while slapping each other on the back. That night, the restaurant chose the perfect soundtrack. Yes, who else but Ol' Blue Eyes himself to serenade us through dinner. With his voice crooning softly through the air, we perused the menu and ordered. The descriptions of the items on the menu harkens back to a time of meat loaf and tuna casserole. 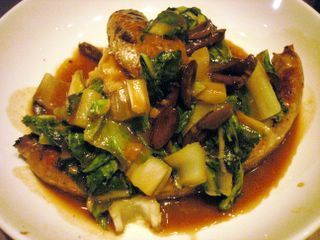 However, the chef, David Slay, is said to wisely and cleverly add a contemporary spin to these staples. A slice of dense wheat bread and a cheese crisp shingle studded with cracked pepper was served with a plate of whipped butter piped into a floret. This butter, they inform us, was infused with chopped figs. The taste was creamy and herby-sweet, almost like cake frosting. 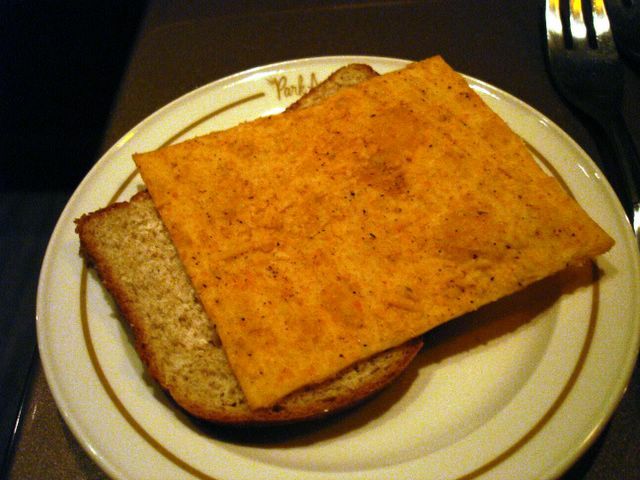 The "Surf n' Turf" ($15.95) intrigued me. 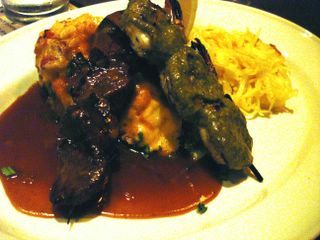 Ordered off the "specials" menu, the filet mignon medallions were threaded through a bamboo skewer. The steak was tender, cooked perfectly to order, and tasted beefy with a slight char. The "Surf" part of the equation came in the form of still squiggly-fresh skewered shrimp glazed in a delicious herby green goo of unknown origin. These morsels of the sea and pasture rested on chunky mashed potatoes which themselves were draped in a layer of melted cheese and a sprinkling of freshly diced green onions. On the same plate were ribbons of light yellow spaghetti squash, faintly sweetened with a touch of honey. These tender golden wisps, I learned later, apparently comes out of the gourd naturally in these fine strands, looking like thin angel hair. A pool of reduction with the essence of pan drippings and red wine, brought the entire dish together. I sopped up each drop by pushing the mashed potatoes around in it. 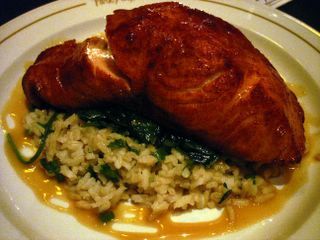 The salmon, also from the "specials" menu ($15.95) was cooked just until it seemed to collapse under its own weight. It was served over a heap of cooked brown rice and wilted spinach. The fish, rubbed in spices and lacquered in sort of a sweet teriyaki glaze came with a bracingly hot counterpoint in the form of a mustard sauce dripped around the periphery of the plate. Another dish from the specials menu, chicken and pork sausage with mashed potato ($11.95) was comfort food, pure and simple. Eventhough it is an obvious twist on the British pub staple, "bangers and mash," this rendition was far from humble bar food. The homemade smoky pork sausage was redolent of caraway seeds, while jewels of fat bursts with flavor. The chicken sausage was thicker but lighter in flavor and color. Oil wilted leaf lettuce, celery, and piquant olives completed this rustic and hearty meal. Dessert was quaintly named the "Lil' Pot of Heaven" ($4.95). 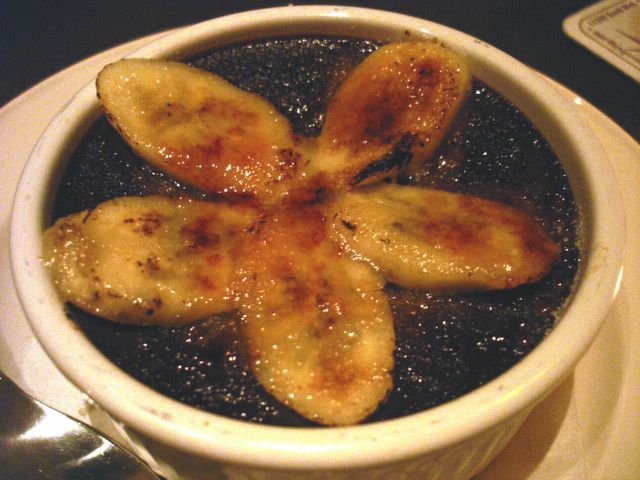 It's a ramekin filled to the brim with a dense, dark chocolate pudding, topped with sliced bruleed bananas. Funny how something with the word "Heaven" in it could taste so sinful. The standout for our sweet tooth, however, was a dessert from the "specials" menu; bread pudding with homemade ice cream and caramel sauce ($5.95). This was pure decadence in a bowl. 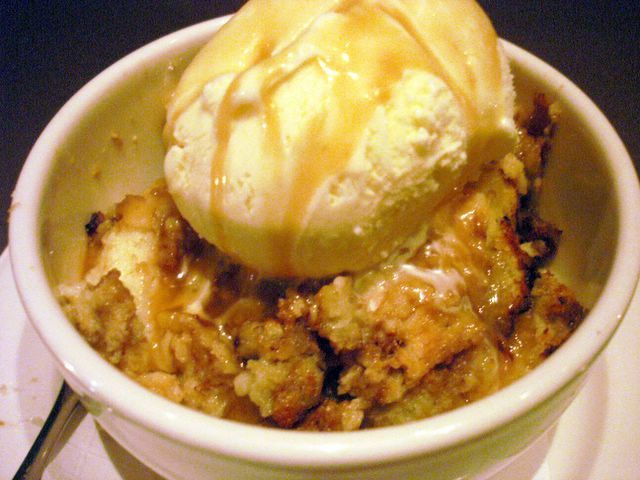 A generous serving of mushy-warm bread pudding and flavor-packed pie crust crumbles was crowned with scoop of vanilla ice cream and a drizzling of caramel. It's not overly sugary but wholly soothing; a dish I can see myself ordering again, and again. Would these dishes have enticed Sinatra and his boys to Stanton? Yes, I think so! and each one has been great. The waiter was telling us that the chef also disdains the use of commerical condiments, making his own ketchup, salad dressings, mayo and even soft drinks (he has one or two every day - the variety changes). I haven't been able to try dessert here yet...too full! I know! Stanton! Whodathunk! But man, I think this is one of those jewels that hopefully will be there for quite a while. The prices are really reasonable too! I heard about that. He makes his own ketchup! Next time, I think I will try lunch, and sample that ketchup of his! The seafood pot pie sounds heavenly too! Awesome review! Your descriptions made me feel like I was there! "It's called a Royale with Cheese"
"It's the one that says Bad Mutha F*cker"
Thanks! BTW, I'm also partial to the whole gold watch speech by Christopher Walken. Great post. I remember when this place was first mentioned on the chowboards and I kept thinking, "Naw, Stanton? Cant be good" But your review (not to mention the great pics) has sparked my interest. Might have to ventue into that area and get a bite. I, too, had second thoughts about the place when I read about the initial hype. But, for once, I think, the hype lived up to it. The review is actually a composite of two visits. Both were exceptional experiences, I'm glad to say. Although the salmon was a wee bit undercooked the second time around. But if you can't already tell, this place is going to be on my regular rotation! It really is! I haven't been this ecstatic about a restaurant since Cafe Hiro. Great review and photos! I've been curious about this place for a while now, and I think your write-up has sealed the deal. Will definitely be heading over soon. Hope you'll do a post on your blog! I would love to read your perspective on it. A new devotee! Your comparison to our other favorite, Cafe Hiro, concinced us to give Park Ave. a try. A very pleasant surprise. I'll get over the "Stanton thing" tout suite. Great food, great service, good prices. mmm, dark chocolate pudding with bananas. Glad you liked it! It's definitely one of the best new restaurants in O.C. The parking lot is no longer deserted but full most nights. As a regular at the jewel of Stanton, I now find myself having to call ahead for reservations. The rat pack would be happy to spend many hours in the small but swank bar, in the warm cozy main room even off in the back "private" room. Try any and every item on the ever-changing menu. You cant go wrong. Good to hear they are doing well. Hope they keep up the quality of the food going. I love the space and feel of the restaurant and keep going back for the tomato soup which is FANTASTIC. Can't get over it's in STANTON. The service has been poor and other operational issues make us wonder why we'd even consider going back but the food is creative comfort food that is so so GOOD!!! We keep going back as we want this Stanton Jewel to be here for a long long time! We visited this restaurant with friends who live in Stanton as we used to. The service was good the food was great and we are going back this evening with friends. Too bad Stanton has such a bad rep but people still keep going into LA, I rest my case. i went to park ave for lunch. the ambiance was beautiful, but i was there mainly for the food. we ordered the chicken pasta and chicken pot pie. 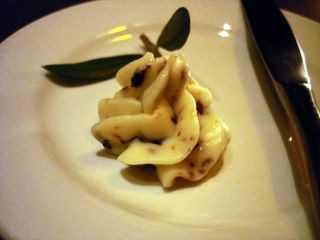 the pasta was rich, creamy and delicious. the pot pie, on the other hand, was truly disappointing. it was bland and tasteless. a marie's calendar frozen pot pie would have been 10x better. i left most of it uneaten. if anyone decides to order the chicken pot pie, let me know how it was for you. Elmo- Think this place is date worthy? I am considering driving there from Irvine on a semi-casual but still need to impress date. Thanks MEalcentric. Definitely think it is date worthy. The prices aren't too steep, and the atmosphere is cool without being stuffy or formal. It's actually like a cheaper version of Houston's in Irvine. Dark lighting, clean design, and attentive service. The food is expertly prepared, but not inaccessible or overly fancy. The place is getting very very popular now, so I think you should make a reservation if you decide to try it. The only bad part is that it's in Stanton. There's nothing on that block worth looking at other than the restaurant. I say eat there and bolt quickly to Buena Park Downtown if you want to see a movie or something. Or go straight home! Let us know what you think if you try it. Have fun, whereever you go! Thanks, I might decide to have a "holiday dinner" there with a large group of friends. The fact that there is nothing around hampers it's date destination. Plus its a LONG drive home after a few drinks. I'm actually eating my leftover chicken pot pie from "Park Ave" as I write this. I think it's pretty good. I guess there's nothing really amazing about it - just a good chicken pot pie with a bit of variation on the crust. I love the desserts at Park Ave. I am not the kind of person who can afford fine dining on a regular basis, but I do splurge on those desserts! Loved the review...I must give it a shot...If you wanted the Jack Rabbit Slim's feel in a restaurant, try Ed Debevic'son La Cienega in Beverly Hills. It sorta brings back a Mel's Diner feel with a couple of Flo waitresses. They break out in a song and dance from time to time. But if you want a real diner and at any given night, might be dining next to a pop star, radio host, actor or what ever Hollywood offers...go to Canter's Deli on Fairfax. I've seen Rodney Bingenheimer (Rodney on the Roq) at one end of the restaurant and No Doubt at the other.